After Cyclone Idai hit Zimbabwe, 24 people have been feared dead while scores are missing. Houses have been damaged and bridges have been washed away. Choppers unable to battle strong winds to carry out rescue operations. Harare: At least 24 people are believed to have been killed and dozens are missing in parts of eastern Zimbabwe, which was hit by Cyclone Idai. Zimbabwe's ministry of information announced on Twitter that so far the "number of deaths is confirmed at 24 mainly from Chimanimani East" including two students, while at least 40 other people have been injured. Many houses have been damaged and bridges too have been washed away in parts of the Manicaland province, which borders Mozambique. A group of people, who fled their homes were "marooned" on top of a mountain waiting to be rescued, but the ministry said that strong winds were hampering helicopter flights. Earlier, a lawmaker told AFP that thousands of people have been affected with power cuts and major bridges have been flooded. "The information we have so far is that over 100 people are missing and some of them" may have died, Joshua Sacco, a member of Parliament in Chimanimani district, told AFP. "At least 25 houses were swept away following a mudslide at Ngangu township in Chimanimani urban. There were people inside," he said. 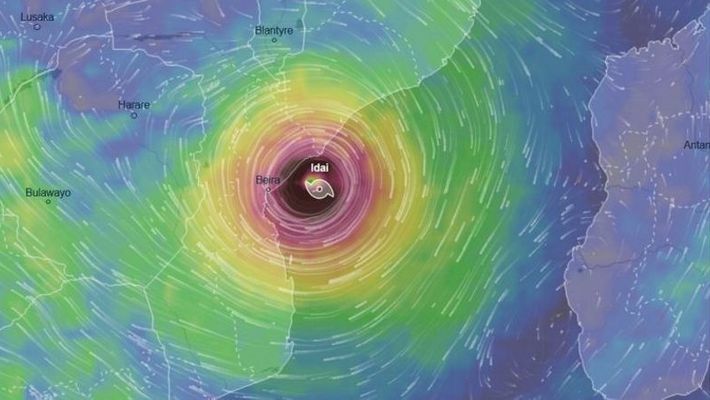 Tropical Cyclone Idai battered central Mozambique on Friday killing at least 19 people there and cutting off more than half a million in Beira, one of the country's largest cities. Local officials in Mozambique said that heavy rains earlier in the week, before the cyclone struck, had already claimed 66 lives. It had also injured scores and displaced 17,000 people. Zimbabwe's opposition party Movement for Democratic Change spokesman Jacob Mafume tweeted that a "serious humanitarian crisis (is) unfolding" in eastern Zimbabwe districts. The ministry of information said the Zimbabwean National Army was leading the rescue efforts. One school has been shut in the area and students were waiting to be airlifted to safety. When the cyclone hit Mozambique, authorities there were forced to close the international airport in the port city of Beira after the air traffic control tower, the navigation systems and the runways were damaged by the storm. An official at the National Institute of Disaster Management (NIDM) of Mozambique told AFP on Friday "there is extreme havoc".